Jackie and Marilyn | Because it doesn't have to be "or"
Hi all! Hopefully you have been following along at our Instagram page, but in case you haven’t, here’s a recap of some of what we’ve been posting. 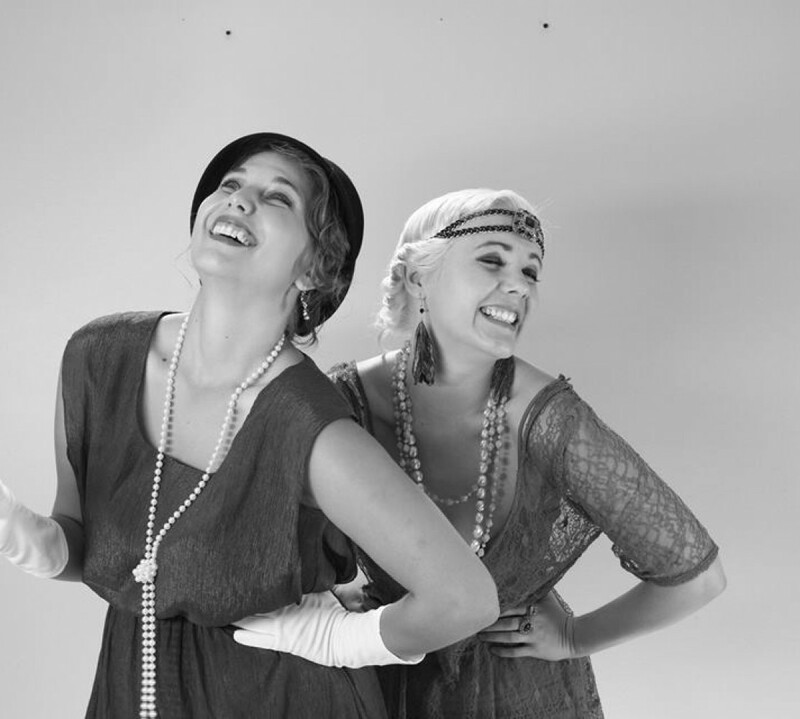 Remember, for weekly updates from us, follow us @jackieandmarilynblogon Instagram! For live updates, make sure you follow us on Instagram! 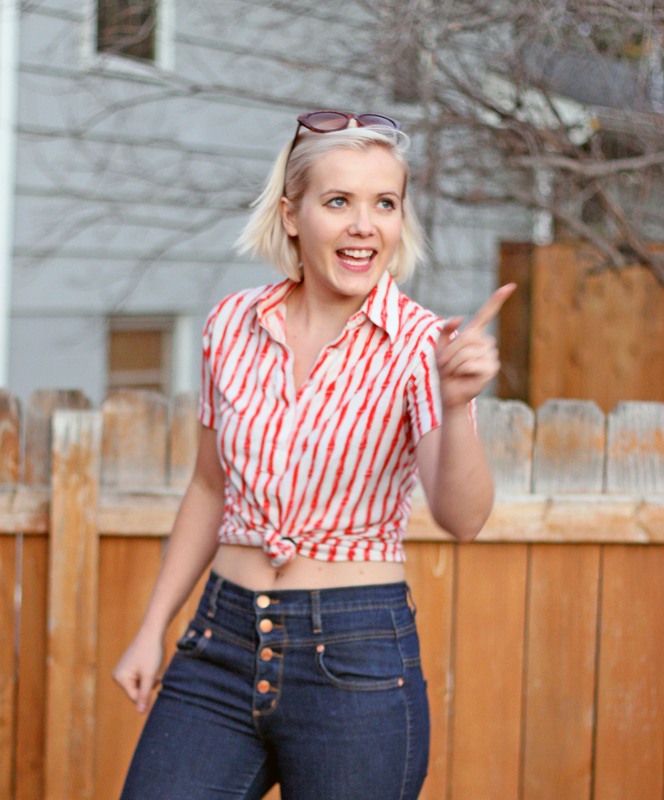 Remember, for weekly updates from us, follow us @jackieandmarilynblog on Instagram! Hey everyone! We are switching things up a bit here at Jackie and Marilyn and wanted to give you a couple updates. We are going to be focusing more of our attention microblogging on Instagram than with the website. We will be posting updates on Instagram throughout the week and posting on the website once a month each with a recap of what’s been on our Instagram account. We think this will be a better way for us to manage our schedules and bring you fashion inspiration on a more frequent basis. If you’re already following us on Instagram, great. If not, follow us at @jackieandmarilynblog! 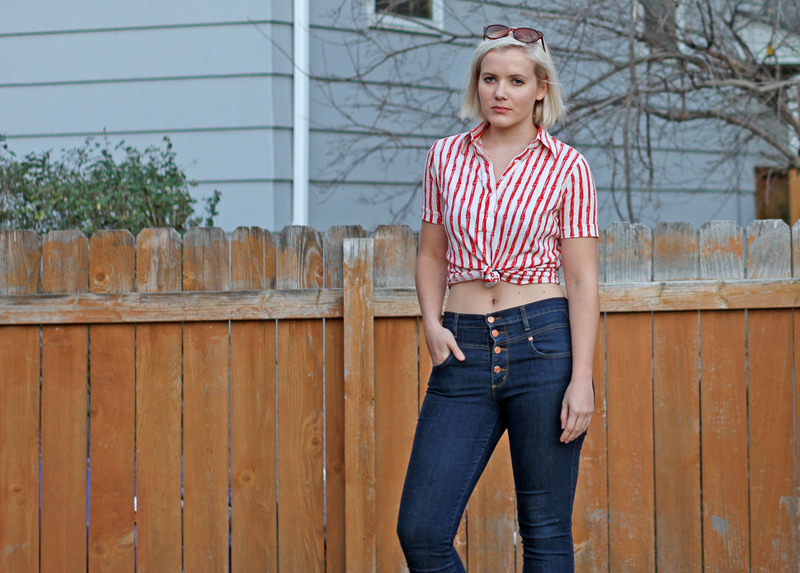 This won’t be my last crop top ever (most likely), but it is pretty likely that it was the last summer-like day for quite some time (it was 70 degrees in November in Minnesota! 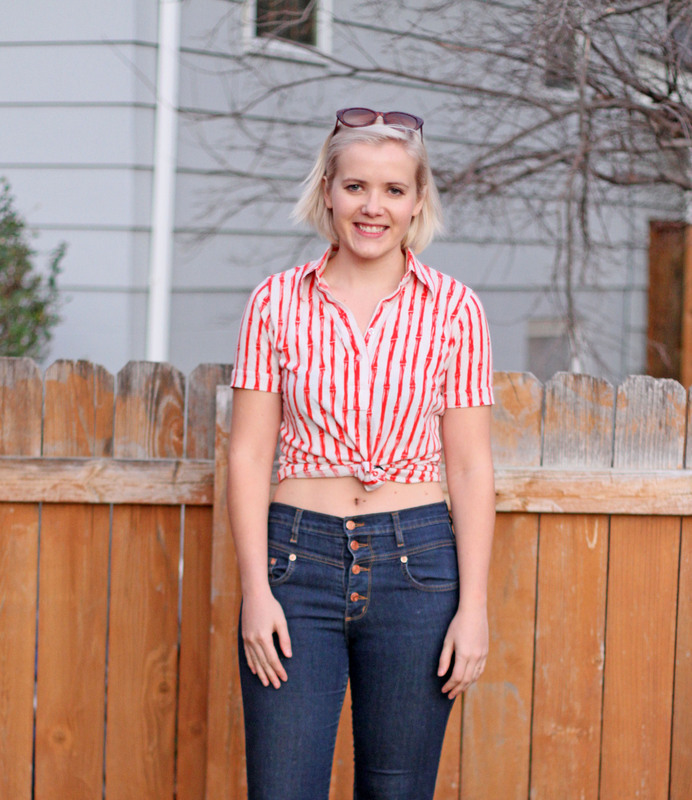 ), so I figured it would my last chance to pull off a summery outfit before I’m covered in layers! 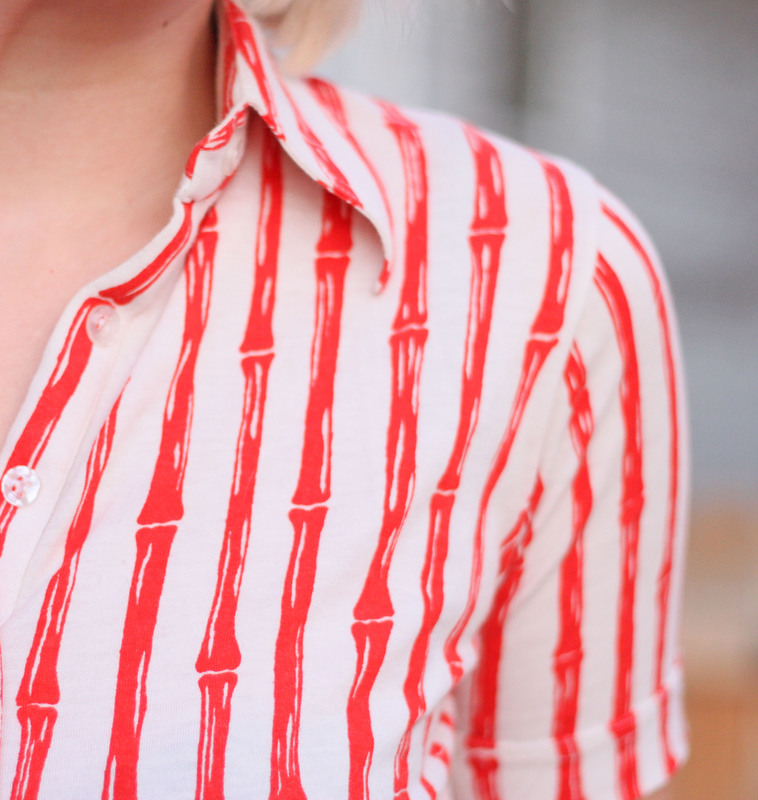 I got this tiki/bones shirt at a local thrift/second hand store in Minneapolis called Buffalo Exchange. I can get into a lot of trouble there, especially because they have a vintage section. I haven’t had a chance to wear it yet, so I figured we were close enough still to Halloween and warm enough still, that I would give it a go! 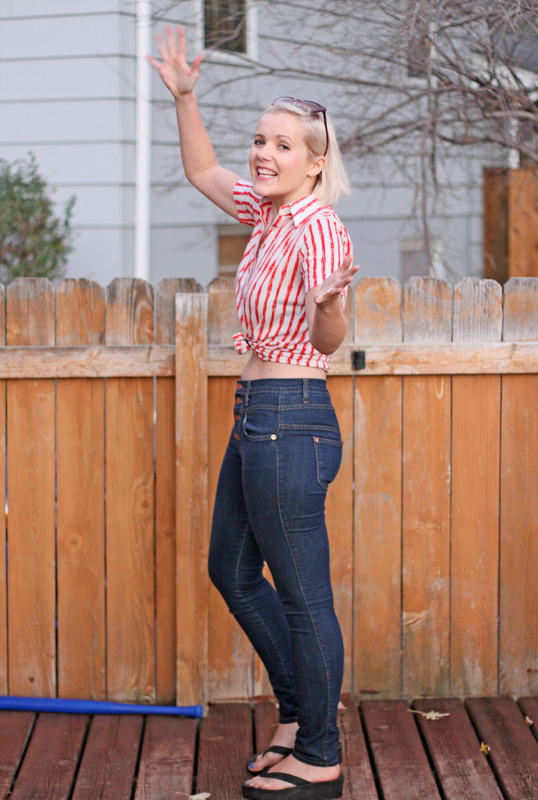 Although it was beautiful out, it is not quite shorts weather anymore, so I opted to wear my favorite pair of jeans, EVER, from ModCloth. I have three different colors because they are that good. I never thought I would invest money in to any leg prisons anytime soon, but these babies are worth it! Since I won’t have a simple outfit in quite some time (hello leggings and layers and jackets, oh my!) I left my outfit as simple as I could. Just throw in some flip flops (I’m miss you the most, flip flops!) and sunglasses and I was good to go. Brianna actually got to come see my new house and help me take these blog pictures before the inevitable early darkness that entered our life with daylight savings time. 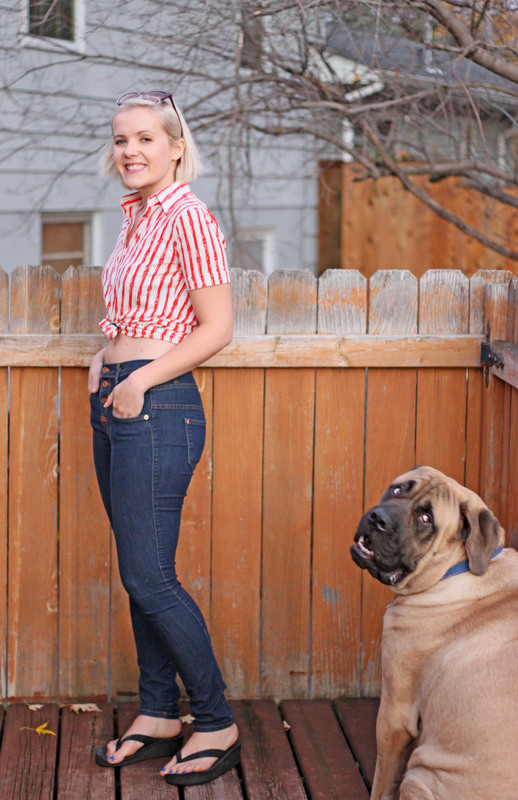 My dog Brim obviously wasn’t going to let me steal his spotlight! 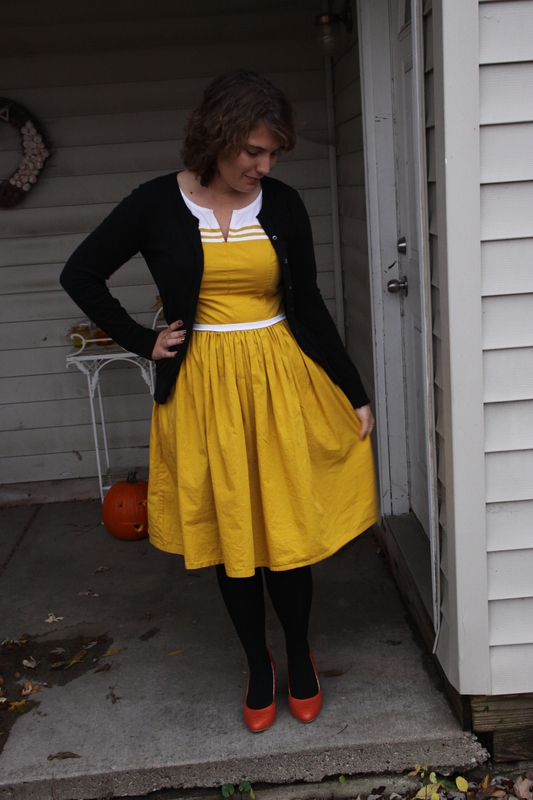 Ever since Melissa’s wedding this summer, I’ve been looking for a way to wear the eShakti dress I purchased for the occasion. It’s a lot of yellow so I wasn’t sure if I wanted to overwhelm it with color. But then again, I didn’t want it to be boring either. Enter black and orange accessories! 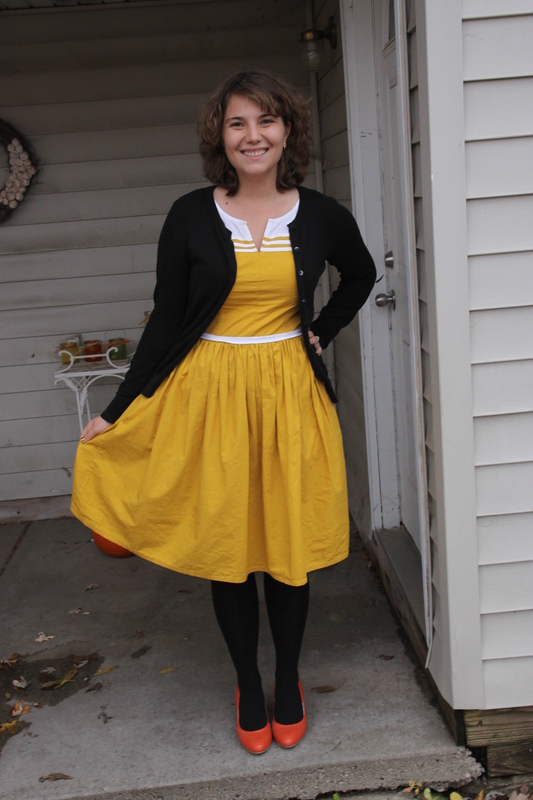 This outfit isn’t just delightfully fall – it is quintessentially Halloween! And considering I wore it for the week before Halloween, it was perfect 🙂 With the white and yellow on top and orange on the bottom, I felt exactly like candy corn! 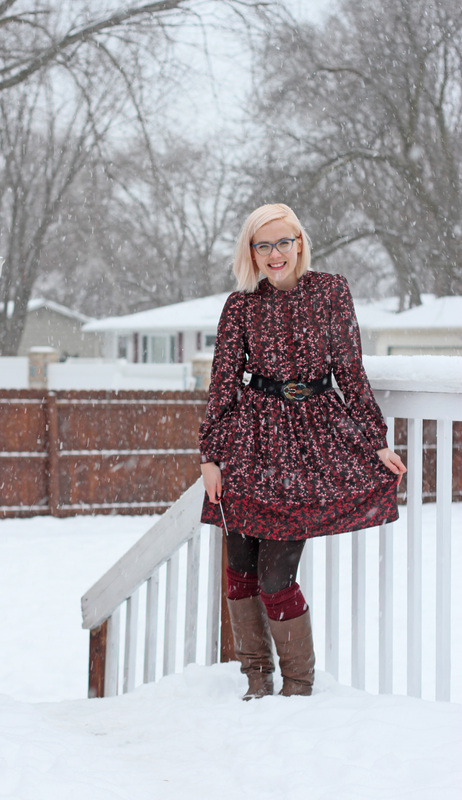 Admittedly, this dress has been a small pain for me because it just does not want to iron flat. The fabric of this dress just doesn’t want to keep out the wrinkles. 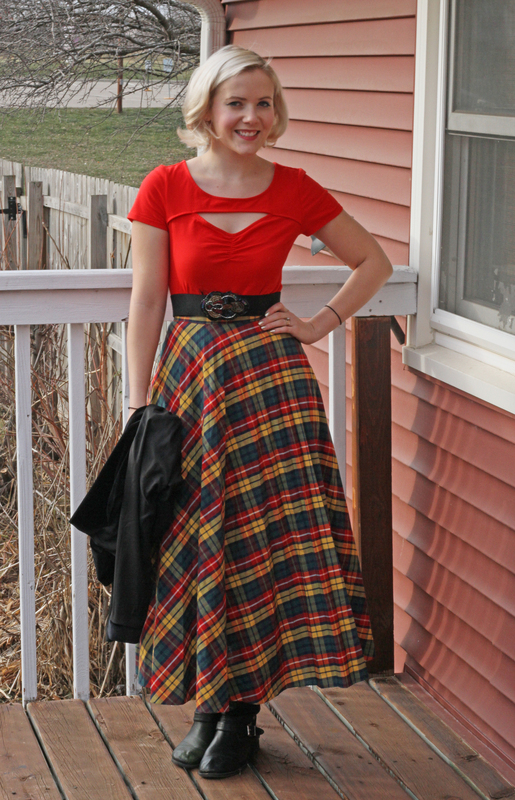 I don’t think it wouldn’t hinder me from getting another item from eShakti, but after ironing the white seam around the waist for the second time, I was begging the dress to lay flat. But I’m not one to give up on a dress so easily! 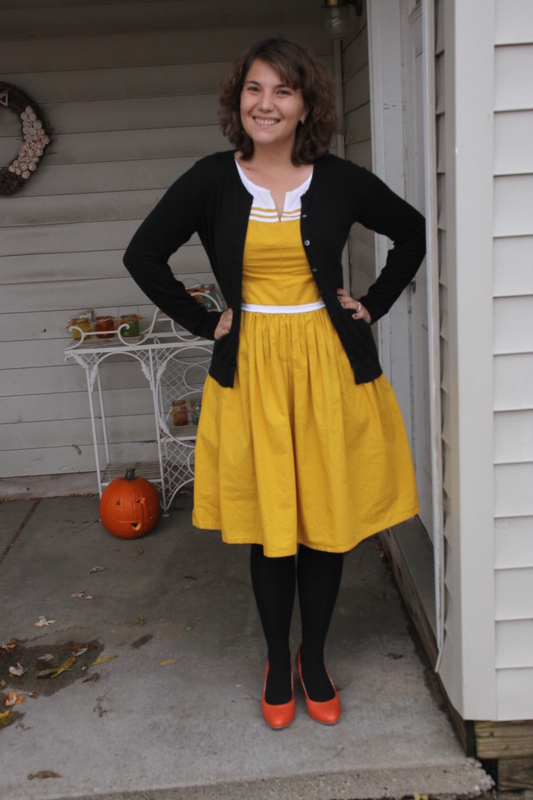 The mix of a black cardigan and tights with the bright orange shoes allowed for some balance between the bold colors of orange and yellow. Do I normally endorse a quirky cacophony of color? Yes. Is it always necessary? No. You can create a fun seasonal outfit without going too overboard if you mix in a universal neutral color to even out the eye-catching tones. 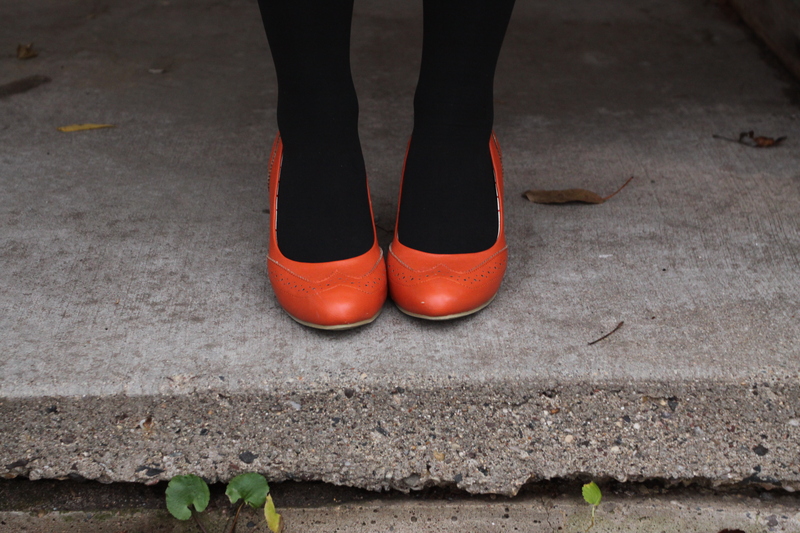 These bright orange heels have been a fantastic addition to my autumn-based closet. 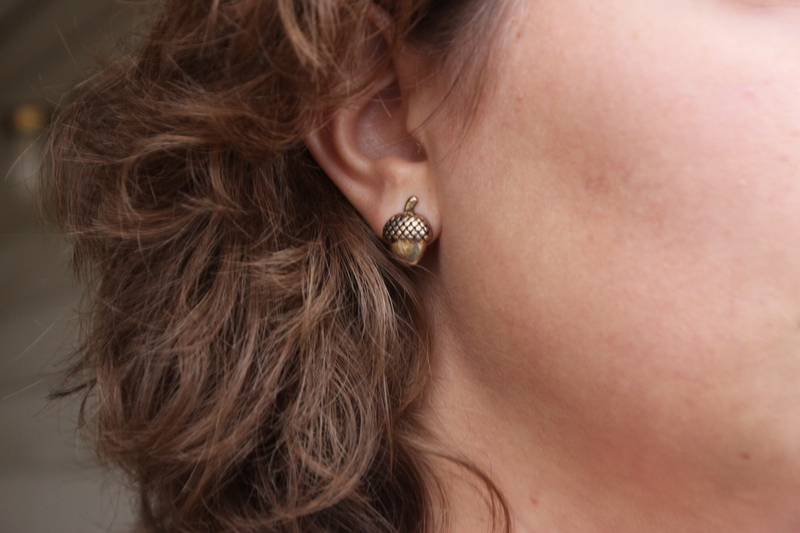 So have these new acorn earrings from ModCloth! Keeping with fall, I now have on the Fall Fancy wrap from Jamberry. 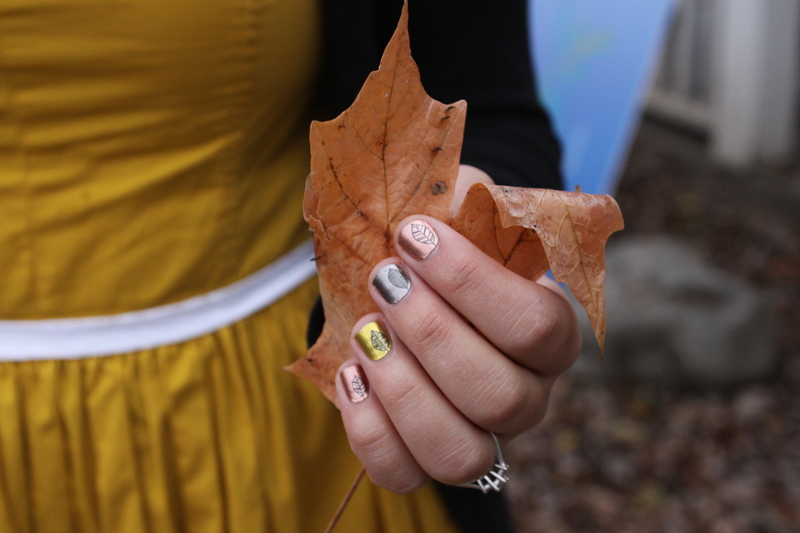 They’re a bit metallic for fall and I think I may save my next manicure with this wrap for the holidays, but they’re still pretty cute and top off an autumnal outfit with their leaf print!